Twenty course participants are seated in a circle of chairs, each with a durable school-style djembe just in front of them. They are intently focused on the charismatic presence of a tall and lanky, and princely-looking, artist-teacher who has joined them for their daily dose of 90-minutes of Wolof-style drumming from his native Senegal. Thione (pronounced “Chone”) is master of djembe, sabar, tama, and djun djun drums, a descendent of a long line of Griot drummers who moved to Seattle to teach and perform. He is a man of few words (or at least he offers little verbiage to participants whom he presumes not likely to understand Wolof or French), and he gets to the point quickly. He models the proper performance position for the djembe drums, checks that all drums are drawn by the players to them, their drumheads tilted towards them, the palms of their hands resting on top of these colorful and durable classroom instruments. Thione begins to slap, pat, and pound rhythms with fingers, palms, and fists, first in a continuing battery of sound at the speed of light, and then in small bits, which, during his own silences, are played imitatively by the circle of drummers. They are in sync, and they have found their groove. As the group’s percussive ostinato repeatedly loops in a mesmerizing flow of crisp “teks” and deep “dumms,” Thione sings a short call and an immediate response. He smiles and nods his encouragement to the circle of drummers, and by the third round, all are singing in response to the Wolof call as it recycles again and again. Now, with drumming and singing locked tightly together, he layers in a bold, free, and expressive solo of syncopations that punctuate on and off the pulse. The group has musically arrived. Thione gives a sharp percussive signal at the wood sides of his master drum, and the experience comes to a cohesive close. Smiles, easy laughter, high fives—something beautiful has transpired, and the course participants and their teacher understand each other through the music they have made. They sing. They play. They dance. They come from their K-12 and university classrooms to seek out the music of the world’s cultures. They are middle school band directors, high school choral conductors, early childhood specialists, teachers of social studies and language arts, doctoral students in education and music, and university professors of music education, musicianship, and theory courses. They are teachers, all, who understand the power of music to gain and maintain the attention of their students, and who find music to be an important key to cultural understanding. These teachers are driven by diversity requirements and multicultural mandates in schools and on campuses, and by their own personal desires to know the music, the musicians, and the cultural meaning beyond the songs, dances, and instrumental works they experience. They are committed to the possibilities of a broader span of musical experiences for their students of music, and to music as a means for knowing multiple histories, languages, and current affairs within and beyond American borders. These dedicated and enthusiastic teachers are participants in the annual Smithsonian Folkways certification course in World Music Pedagogy at the University of Washington in Seattle. They are gaining experience through guided listening to the recorded music of practiced musicians across the world, making music because they must, and connecting the dots between their own musical participation and pedagogy. They come with a wide span of musical backgrounds: some with university degrees in music and others with little formal musical training but great valuing of music as an important part of their lives and a key component in the education of their students. Sometimes, their schools and universities send them, tuition-paid, to the course, although many more voluntarily arrive ready to make music and to work through the pedagogical possibilities that will ease them into fresh approaches to lessons, lectures, and special projects with their students. Percussion music is central to the teachers’ experiences in the summertime Smithsonian Folkways course. They are in search of the music that is immediately appealing to them, as it will be to their students—music that is crisp, quick, pulsive, rhythmic. They are drawn to the recordings and live experiences that feature the rhythms of various drums (and sticks, bells, and shakers). They are enticed by the driving energy of percussive guitar strums, of full-scale marimbas, steel drums, and gamelans. They are keen to know the musical timbres, tones, and textures of percussion music in all parts of Africa and the African diaspora—in Afro-Caribbean cultures, throughout Central and South America, and in the United States. They are curious to sample the sounds of differently shaped drums from across North Africa and the Middle East, and in Asia and the Pacific. 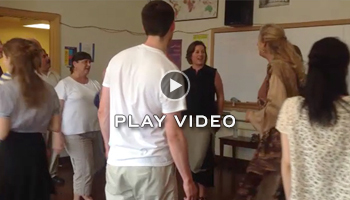 As these teachers listen collectively to the Smithsonian Folkways recordings, they cannot help themselves but to get their groove on—tapping, patting, nodding, popping, and locking. In fact, no sooner does the sound commence than does “rhythmicking” emerge, in which keen listeners find themselves in the act of sounding out the rhythms with their hands and feet, and with any available “found sounds” whatsoever. The percussive rhythms invite participation, even as they set the creative energy of teachers in motion to determine pedagogical pathways for the application of the music to the curriculum. Samplings of rhythmic percussion music abound throughout the rich collection of Smithsonian Folkways Recordings, much of it already embraced by teachers in their pedagogical designs on the site called “Tools for Teaching.” A cursory review of percussion music for listening (if not singing, playing, and dancing, too) appears at right, with an open invitation for teachers, performers, and avid listening fans to join in with the rhythms as they sound. What’s not to love about the rhythms of the world’s cultures? Participants in the certification course, exploring the human range of musically expressive practices, take immediately to the percussion sounds they can sing (and chant), play—on instruments and objects—and dance to. They discern differences between cultures of instrumental and vocal colorings, and they explore cultural reasons for the diversity of distinctive sounds of instruments, including drums. They allow music to serve as gateway to cultural—and multicultural—understandings, and they enthusiastically finish the course more rhythmically alive than they were at the start. They sing, play, and dance, and they develop ways to ensure that their own students can experience music, musicians, and their cultural surrounds. Look for updated information about University of Washington’s annual Smithsonian Folkways certification course in World Music Pedagogy on this website. Additional courses are offered at the University of West Virginia, Indiana University Bloomington, and the University of St. Thomas (St. Paul, Minnesota). Audio, video, print, electronic, and human resources—that is, visiting artists and culture-bearers—are sampled in this intensive course, and musical experiences are tailored for use at various levels, including in classes for children, youth, and adults in university and community settings. Patricia Shehan Campbell is Donald E. Peterson Professor of Music at the University of Washington, where she teaches courses at the interface of education and ethnomusicology. She teaches World Music Pedagogy certification courses and serves on Smithsonian Folkways’s advisory board. From left to right: Education assistant Amanda Soto, education assistant Christopher Roberts, workshop director Patricia Shehan Campbell, and Smithsonian Folkways education specialist Meredith Holmgren. June 2013. Listen to the Ghanian gankogui, or double bell. Pat the leg for the low bell and clap the hands for the high bell, staying constant regardless of the melodic elaboration by the singer. Listen to the mridangam (double-headed drum), and find the repeated rhythmic pattern that is prominently heard in the performance of this traditional song. Tap out the ostinato rhythm, accentuating the first of every four beats. Listen for the rhythm sticks, shakers, cowbell, and drums, and “play” the rhythms on legs, table tops, or floors. Try out the various instrumental rhythms, challenging oneself to switch parts on occasion.